It’s only 12 days now and I’m going back home for two weeks. I try to go back to my home country, Taiwan, once every couple of years so I can catch up with friends, see my family, do some shopping and perhaps most importantly have a rest. I’m especially desperate to go home this time as two of my relatives died last year but I wasn’t able to go back. So with this in mind I’m making food that I regularly eat in Taiwan. This recipe, called Prawn and Scallop Shumai doesn’t have a story behind but even though it originates from China it’s a popular dish in Taiwan. If you remember some time I made another kind of shumai which contained glutinous rice and I’ve been wanting to make another kind of shumai since then. Shumai itself is basically dim sum, but with a different name. They can be made really quickly and you can put whatever you like inside but for this recipe I chose one of my favourite things which is scallops. I have bit of a love hate relationship with scallops. I really like the taste of scallops but one of my regular jobs in my chef job is to empty live scallops from their shells. For anyone that’s opened a scallop before you’ll know that can have a nasty bite to them but nonetheless they’re really tasty. Use a food processor to blend all of the ingredients. Put the filling use a teaspoon into the fillings as shown in the procedure photos below. Cut the ten spare prawns in half and then place one on top of each shumai. Steam the shumai for around 15 minutes. It’s now ready to serve. Shumai can be eaten on it’s own or you can dip it in some soy sauce. Egg Spinach and Squid Roll Recipe. Recently I’ve been busy doing a series of speeches in Glasgow for Chinese New Year. I was asked by www.ricefield.org which is based in the trendy Trongate building in central Glasgow if I could present some speeches as part of their celebrations for Chinese New Year. These have now finished, spring is coming and I can now focus properly on my blog once again. I’m also going back to Taiwan for a couple weeks at the end of March which I’m super excited about. Today I felt like making a roll and while I didn’t want to do sushi I wanted to make something that looks fairly similar. This recipe doesn’t have a story about it but it has a delicious egg skin filled with squid, carrots and regular seasonings. This dish is light to eat but tastes really good if you like squid. Hope you enjoy this recipe. I’ll also be doing another Western recipe in the next couple of weeks, this time a Focaccia, so keep an eye on my site for that. Remove the skin and insides from the squid and give it a thorough clean. Cut the squid into small dices and chop up in a food processor until the mixture is fine. Add the egg white, salt, pepper powder and sesame powder and blend for another couple of minutes. Chop the carrots and spring onion. Mix with the mixture from the previous steps evenly. Leave aside for later. Mix all of the ingredients together and heat up a frying pan with a couple drops of oil. Fry the eggs as you would do when making a crepe (the skin should be quite thin). An important part of the procedure is to make sure the potato starch or corn flour has been mixed with the one tablespoon of water before it’s added to the egg mixture. This is to stop the potato starch having lumps. Blanche the spinach, rinse under cold water and squeeze out as much water as you can but don’t squeeze so much as to damage the shape of the leaves. Lay out the spinach on the egg skin as the photo below shows. Spread the squid mixture evenly on top of the spinach as the photos below show. Roll the egg skin, spinach and squid filling and cover with cling film. Roll the cling film on the counter or chopping board a few times to make sure the roll has been rolled evenly. Use a steamer to steam the rolls (including the cling film) for around 20 minutes. Once steamed cool the rolls in a fridge or leave aside. Once cooled chop into suitable sized shapes. I wanted to mimick sushi with my rolls so I chopped everything about the same size as I would do with sushi (each slice is maybe 1.5cm wide). It's now ready to eat! Something my husband’s colleagues keep asking for is chicken satay. They are fully aware that I’m a chef and they’ve tried many of my dishes, including chow mein, salad boat sandwich, shenjiangbao and even thai green curry but they keep asking for satay. I must highlight chicken satays are NOT Chinese or Taiwanese foods, they come from Indonesia. However in the UK if you ever go to one of the popular Chinese buffets or takeaways, doesn’t matter which one, you’ll nearly always find chicken satays on the menu. I understand these restaurants and takeaways want to cater for a lot of tastes but again satays aren’t Chinese or Taiwanese. I do however like eating chicken satays and while this satay recipe probably isn’t like a traditional satay this is the way I like to make them. I also made a pickled vegetable salad to go with this satay recipe. I’m not a big salad person but this salad is both sweet and sour and suits these satays ideally. Marinade chicken fillets with all of the seasonings and store in a fridge to marinade for at least 1 hour. Char grill or barbeque the satays (I used a griddle pan for this recipe). Peel the shallots and carrots. Slice the shallots and raddish as thinly as you can but only as comfortable as you can. Shred the carrots. Boil all of the seasonings from the sichuan pepper to the sugar. After the seasonings have boiled turn off the fire and add all of the vegetables. Leave it aside to cool down. The dish is now ready to serve but if you want to you can mix the salad with mixed salad leaves. As promised in my first blog of the year I’ve decided to start adding Western foods to my website. Some of the foods I have learnt through working as a chef, some through friends or family, and some have been influenced by my travels. 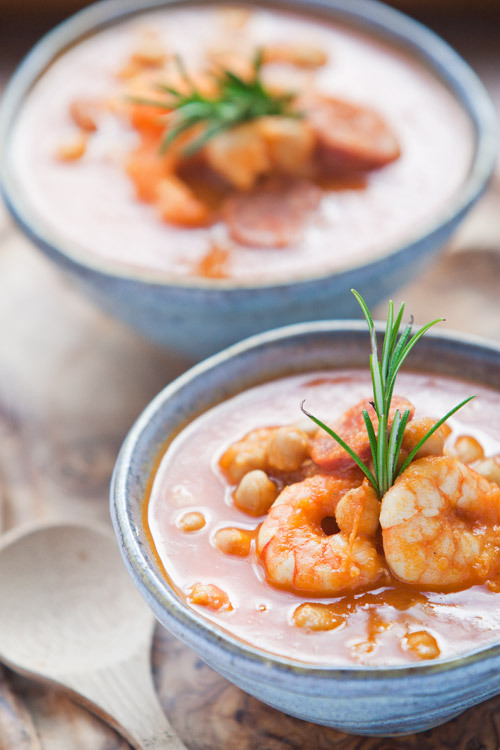 Today I’m sharing a Spanish Chickpea, Chorizo and Prawn Soup recipe. When I travelled to Madrid last year we went to a really famous market called Mercado de San Miguel which offers really beautiful foods and at a couple places that offered food that can be compared to fine dining. We tried a Prawn and Egg on toast dish, which Chris really liked, but our favourite thing was a Spanish soup called “Garbanzos con Langostinos Y Jamon”. This fabulous dish costs 10 Euros a bowl and consisted of a tomato soup with chickpeas, jamon and langoustines. I personally don’t like copying recipes exactly so here is my variation of this dish. I put chorizo in it instead of Jamon, so it’s a bit spicier and the taste is richer and I used prawns instead of langoustines. As much as I like langoustines they’re a bit difficult to get hold of, even in Scotland! If you travel to Madrid I really recommend travelling to this market. I’ve included a few pictures of the market below and trust me the food there is beautiful but I hope you enjoy my recipe also. I’ve also written a recipe for “Chorizo Foraccia” which I’ve included in the photos here. Chop the onion and garlic finely then heat 2 tablespoons of olive oil in a stock pan. Sauté the onion and garlic first. Sweat these in the pan then add the carrots and sauté for another 2-3 minutes. Add the freshly chopped tomatoes and rosemary and sauté for another 2-3 minutes. Then add the tinned tomatoes and 1 litre of stock. Bring to the boil then simmer for 30 minutes. Remove the chickpeas from their packaging and rinse under cold water to refresh them. Cut the chorizo into thin slices and remove the shells from the prawns. After 30 minutes puree the soup with a pinch of saffron to add colour and leave aside. Heat 1 tablespoon of olive oil in a normal pan and sauté the chorizo first until the fat from the chorizo comes out. Once the fat starts to come out of the chorizo add the chickpeas and mix together. Keep mixing/frying for 3 minutes to let the chickpeas blend their flavour with the chorizo. Combine the chickpeas and chorizo with the soup in a suitable size stockpot and simmer for another 30 minutes. Add the prawns and cook for another five minutes (the prawns should only take about 5 minutes to cook) then it’s ready to serve. Season with salt and pepper to suit you taste. I used some rosemary to garnish the dish but that’s entirely optional. Mustard Green Chicken Soup is one of our traditional Taiwanese New Year dishes. The long stalk from the vegetable represents long life and it’s simply a great dish for Chinese New Year. The Mustard Green vegetable is also known as Brassica Juncea. It’s a kind of mustard plant that not only Chinese people use in their food but also Indian. It has a very unique taste that has a kind of horseradish-mustard flavour. Another thing worth mentioning about Mustard Green is it’s healthy benefits. Mustard Green contains high levels of Vitamin K, C and A as well as being a good source of folic acid. Mustard Green also provides a rich source of anti-oxidants and flavonoids which can help the body prevent prostate, breast, colon and ovarian cancers. Regular consumption of mustard greens in the diet is known to prevent arthritis, osteoporosis, iron deficiency, anaemia and is believed to protect from cardiovascular diseases, asthma and colon and prostate cancers. I love drinking hot soup in the winter. Maybe it’s me but this winter seems to have been particularly long so whenever I get a chance I make a hot soup. It’s comfortable, warm and keeps your whole body warm during the winter. Last week I had a speech about eating Chinese food in Glasgow as part a Chinese New Year festival and one of the foods I was promoting was soup. SOUP is a really important part of Chinese cuisine. Chinese and Taiwanese soups are completely different to western soups. A lot of western soups are cooked using butter and cream but we like to think of our soup as art. In Chinese cooking, we use many different ingredients for soup but our soups are seasonal and also medicinal. If I’m sick with flu for example, I like to add a bit of ginger in my soup. A lot of Chinese people will also put different kinds of Chinese medicine in their soups to maintain their bodies and improve their health. As you can tell, it’s very different with Chinese cooking. A good soup can be healthy, filling, good for your belly, improve your stamina and strengthen your health. So this mustard green chicken soup not only has a great meaning but is really great for your health. It’s a really supern dish to start your New Year with. Blanch the chicken and rinse under cold water to give it a quick wash. This process gets rid of any unpleasantness from the chicken. Put the chicken into a stockpot and add ginger. Add water until the contents of the stockpot are covered. Boil it first then simmer for 1 and half hour. Check the chicken meat is soft and put the mustard green into the soup to cook along with the chicken. Season the soup and it’s ready to serve. I hope everyone had a great Chinese new year this year. After I introduced you to a few Chinese New Year dishes and explained why we have those dishes for our Chinese New Year dinner. I realized after writing these that I didn’t tell you about the origins of Chinese New Year. I think there are many different stories behind it but my favorite one is about “monster Nian”. We believe Chinese New Year started in ancient China when an evil monster called Nian who had a head like a lion and a body as strong as a bull, lived in the deepest ocean but every January or February he would leave the ocean and damage villages and kill animals and people. Everybody was really suffering because of this but the villagers then thought about a plan to stop Nian. They found Nian was sensitive towards fire, strong lighting, red colour and loud noises. So the villagers started wearing red clothes, stuck red paper on their doors, played with fire crackers and they were successful. Nian was terrified and stopped attacking the villages. The people were so happy that they had got rid of Nian that every year around January/February they would have a big celebration with their family and friends. They and indeed we celebrate by wearing red clothes, shooting firecrackers, eating and drinking and partying all night. This is the origin of Chinese New Year. After the origin of Chinese new year. The recipe today is a Taiwanese dessert that we will usually eat or use it to pray to Buddha and hope he will bring us a good year. This dessert in Chinese is called “發糕 Fa-Gao”. It has meaning of “promotion” so we believe if you eat this cake you will receive a promotion this year. Here is my recipe for this Taiwanese dessert “發糕”. I hope you like it. 1. Mix all the ingredients together evenly and leave it aside for 20 minutes. 2. Place 4~5 small bowls in a steamer and steam at full power for 5~8 minutes. 3. Place cup cake paper into small bowls and fill the cup cake paper until 90% full with the mixture. 4. Steam it for 30 minutes and don’t open the cover or lid or the Fa gao 發糕 won’t rise up. * The second photo shows the original flavour Fa gao. All you need to do is just don’t put any dried berries, strawberry jam and red food colouring into the recipe.